Which is the quintessential Scotch whisky island? Islay? Not a bit of it, says Neil Wilson. Instead, take a ferry to Brodick and sample a little of the historically prized ‘Arran Water’. When I first researched the Hebridean distilleries in the early 1980s, I ignored Arran, simply because there was no distilling activity on the island at that time. The last legal distillery had closed in 1837, so it was of no intellectual interest to me at that time. It also meant that I did not visit the island until the summer of 1996 when, lo and behold, the new distillery at Lochranza had been in production for a year. I had a lot of catching up to do and I have come to realise that Arran is, in a way, the whisky island, largely due to its well-recorded relationship with smuggling and illicit distilling activity that went on over the 18th and 19th centuries. Islay, on the same basis, struggles to compete. Any journey to Arran for me is not so much about what the island has to offer the visitor (which is a helluva lot), but rather about what more it can reveal to me about its distilling past. Oh, and another word is going to crop up a lot here… water. All roads to Arran are over the water, courtesy of Caledonian MacBrayne, and terminate at the island’s largest township, Brodick. The introduction of the RET (Road Equivalent Tariff) in October 2014 by the Scottish Government has meant a huge reduction in fares and a massive increase in visitors. (A return Ardrossan/Brodick fare for a driver and a car is £37.70 as I write). Many of these visitors will make sure they visit the distillery at Lochranza, which is now drawing some 65,000 punters each year, but most of them will simply be ticking it off the island itinerary and leaving with a bottle or two (most likely including an Arran Gold cream liqueur – try it and you’ll see why) and a souvenir. Only the hardened whisky geeks will stock up on the Arran whiskies and want to know why the distillery was built there. The answer is of course, water. Or rather, access to it. Water may be God-given on Arran, but to whom it belongs after that is a matter of much barroom disputation (depending on your point of view). On my last visit I stayed in chic, boutique The Douglas Hotel, a red sandstone affair directly opposite the ferry terminal, and renovated from 2009-11 by Sean Henry, who left the island and made his fortune in Russia in property, and who also owns the Merchant House Hotel in Tallinn, Estonia. He spent a tidy sum (it shows) on The Douglas, putting something back into the island on which he had been brought up as an adopted child by the Campbell family. His foster-sister Elaine helps run the place now. If money is not too tight, this is a great base from which to explore. The roads on the island are very variable and, due to the high watercourses that tumble down the slopes to the sea, landslips and debris lying over them are not uncommon after a storm, so go canny. My Fiat Panda was ideal for getting around the place, as it could squeeze past the buses and trucks on the narrow sections. From Brodick, the A841 road encircles the island, but a couple of cross-country routes effectively create a rough figure-of-eight by way of the String and the Ross roads. The top loop goes around the mountainous north, while the southern loop explores the relatively pastoral coastal fringe. It’s good bicycling country, but if you leave the coast roads, be prepared for major hillclimbs. Arran is a food and drink brand today and you are never far away from quality produce. Arran Visitors Centre, just north of Brodick at Home Farm, is where the Isle of Arran Cheese Shop and the Smokehouse Shop are based, alongside Arran Aromatics. A bit further on is the Isle of Arran Brewery, one of Scotland’s leading independent brewers, where you can tour the brewery and sample the beers as well. Further along on the A841, Brodick Castle stands above the woodland garden that stretches down to the road. Once it was a seat of the Dukes of Hamilton, but since 1958, when it was acquired from the Fforde family, it has been a National Trust for Scotland (NTS) property and is open to the public. 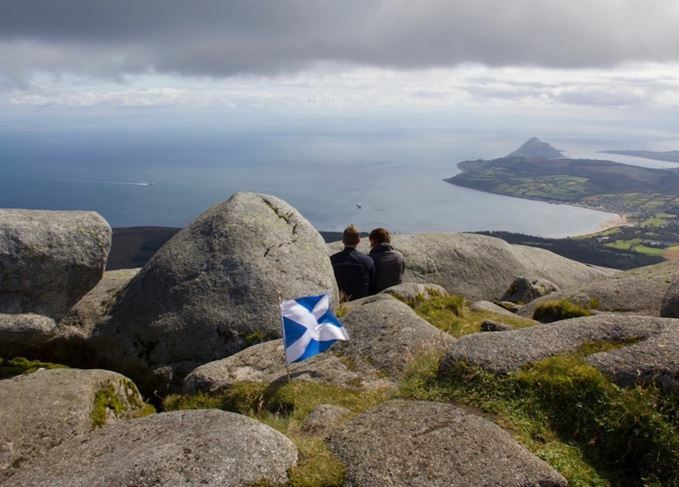 From its grounds it is possible to access another NTS property, the 874m Goatfell, the highest mountain on the island. However, a part of Arran still remains under the ownership of the Fforde family, who maintain around 16,000 acres in the north of the island – and who have played a part in the re-establishment of whisky distilling on the island. Very few illicit distillers operated in the north of the island but, as the Duke of Hamilton owned the entire island in the late 18th century, he had to deal with the practice wherever it occurred. Much of the Excise collection was ‘farmed’ out to landowners in the remoter parts of Scotland back then. This meant they paid the Excise an estimated amount quarterly (known as ‘composition’) and were left to collect what they could from their tenants. Some of them distilled legally but, along the more pastoral southern coast, illicit distilling was rife, with 50 known stills operating in the late 18th century, and 17 in 1817, all of them serviced by the Campbeltown plumber Robert Armour, who kept secret accounts of his transactions. I have seen the site of an illicit still at Knochenkelly, above Whiting Bay, and another bothy at Lochranza was broken up over 60 years ago when it was discovered being used as a play den by a local girl. When illicit distilling was at its height, the stuff that was smuggled across to the mainland was known as ‘Arran Water’ and was regarded as the best that could be had. John MacCulloch, a geologist and traveller, stated in 1824 that Arran Water was “in the older days … the Burgundy of all the vintages”. It was this historical reputation that helped bring distilling back to Arran. When the Currie family from Ayrshire were convinced by David Hutchison, a Glasgow architect with property on the island, that Arran was perfect for their vision of building a new malt distillery, they set about the search for the water. Round the far north of the island, with the help of David’s geologist son Mark, and after discounting a source in Glen Sannox, they assayed the water from Loch na Davie, high up Gleann Eason Boirach to the east of Lochranza, and found it to be perfect. It also happened to run down past a greenfield site at the end of the village where a distillery could be built. All they had to do was secure the water and the site. The Ffordes wanted to charge a rate per litre drawn from the river, but Hutchison and the Curries refused as they were firmly in the God-given camp (see above), so the estate withdrew their demand and also sold them the land for “pennies”, as Hutchison recalls. Within the bounds of the village, on a spit of land stretching out into the sea loch, stands Lochranza Castle – used in the 1960s as the model for the castle in The Black Island, one of The Adventures of Tintin comics. It is a Historic Scotland property and admission is free, but bear in mind that this is a maintained ruin. Meanwhile, Lochranza Hotel sports an impressive range of malts in the bar, and the owner even has a cask lying up at the distillery. Down the west coast, the villages of Catacol, Pirnmill and Blackwaterfoot follow. The former has a unique, pale blue corrugated iron kirk and the latter is just south of Machrie Moor, where six ancient stone circles exist, some with stones over 5m in height. The Machrie Bay Golf Course (one of seven on the island) is also nearby, and Blackwaterfoot hosts the Arran Butcher, selling excellent Arran-sourced meats and home-made black pudding and haggis. The coast road then takes us round to the south side of the Arran Water story. At Lagg, a hamlet deep in a dell on the banks of a river, the last legal distillery operated until 1837. Now only The Lagg Hotel remains as a reminder of that time. Established in 1791, it too had a part to play. In 1860, three casks of whisky were landed nearby, but the Excise officers were diverted by the brother of the innkeeper (whose whisky it should have been) to share a convivial drink. On returning to their haul they found the casks had been filled with seawater. Return to Brodick up the east coast by way of the Kildonan Hotel on Arran’s most southerly point, which enjoys the best views of any hotel I know. On a summer’s day, it is bliss. Whiting Bay follows, where a walk up to the Glenashdale Falls will get rid of the cobwebs, and then to Lamlash where the Holy Isle ferry takes nature lovers and those in need of spiritual succour of another kind to the Buddhist retreat out in the bay. For more information on Arran go to the Visit Arran website. An increase in single malt exports helped Isle of Arran Distillers to record a £1m profit in 2015. The Isle of Arran Distillers boss reveals plans for Lagg distillery, and the island’s peaty future.